The Atlas Salt Treatment Table provides an easy-to-use and very comfortable method to deliver salt's healing properties. Innovative Flex-Block™ Salt Bed provides the benefit of direct skin contact with perfectly-warmed salt, without any worry about sanitization. Unlike granular salt beds, the Atlas Salt has a solid surface that is easily sanitized before each treatment. Bamboo and salt are ideal for green spas. Massage Converter Top Size 33.5" x 83.5"
Height Range 24.5" to 34.5"
This all-in-one chair with its ability for multiple positions makes it perfect for facials, medical procedures, massage, even manicure and pedicure. Fully upright 90 degrees, zero gravity or flat are just a few of the many ways you can use the Soho. While striking with its tapered silhouette and LED lit Iceblock™ shelf, the Infinity GT’s true innovation lies under the hood. For the first time, LEC incorporates a removable Strata GT™ mattress with a proprietary Hexagel™ layer providing the perfect balance between softness and response. The Infinity GT sets a new standard for client comfort and therapist access. Truly revolutionary. Standard features include square corners, upgraded laminate options and a warming drawer. Width options: 30�� or 32�� x 73�� L. Height range: 25��-37��. Recommended lift capacity: 625 lbs. Featuring an extraordinary 6" Strata™ memory foam cushioning system, a built-in warming drawer, LED lighting along the underside of the table top/upholstered frame, and an embedded table warmer. This spa treatment table is the latest innovation from LEC, featuring the industry's lowest "true-measure" height range. It offers electric height adjustment, a fully electric salon top, and well-situated tilt-out storage spaces for extra storage and convenience. Options include the super soft and comfortable Strata GT™ SpaMattress™ that provides the perfect balance between softness and response, a heated top, designer laminates, luxury upholstery, tilt-out cabinets for a modern-design finish to name a few. The unique Pro Salon Valencia maximizes client comfort and healing through an innovative system offering easy electronic armrest adjustments to lengthen the spine and stretch shoulder and neck muscles. LEC’s patented embedded Caress™ Facecradle system allows for optimal head and neck positioning, reducing spinal compression and neck discomfort during massage. 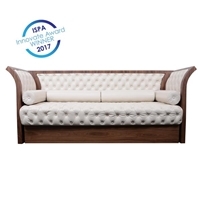 Packaged in a timeless hardwood cabinet with all the multi-functional spa features of the renowned Pro Salon, the Valencia represents the leading edge of therapy treatment tables. Discover the perfect balance of poise and comfort with the new Pro Salon Kensington. The groundbreaking Nuage line features LEC's proprietary Electra-Glide lift actuators, the quietest, smoothest, all-electric lifting actuators in the market today. Specifications: Width: 28" 30" 32" Length 73" Height: 25" - 37"
The Pro Salon continues to be the first choice among five star resorts and spas for its state-of-the-art features. 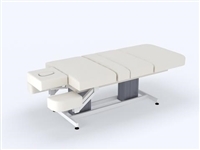 The Aspen GT™, the supercharged version of the classic Aspen multipurpose treatment table, features a removable Strata GT™ 7” spa mattress with a proprietary Hexagel™ layer providing the perfect balance between softness and response. Offers an extended height range with unsurpassed client comfort on a stylish modern dual pedestal base. Hydraulic legs, combination hydraulic/electric table. Legs extend to raise entire cabinet.